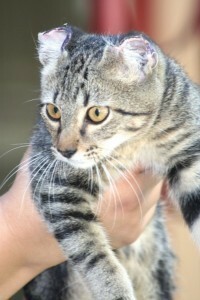 A grand jury in our county in Texas has indicted the men who are suspected of torturing Tiger, my neighbor kitten. Back in September, when the whole thing happened, the police arrested Gerardo Rivera, who is 19 years old and still in jail here. Unfortunately, his cousin Pedro, 18, seems to have fled to Mexico, but if he comes back to our town, he’ll have to stand trial too. The Seguin Gazette Enterprise reported that Tiger’s human got a lot of pressure to drop the charges against the Riveras. Good thing we have a district attorney here who will not let abusers off the hook. While Tiger and his family wait for the wheels of justice to turn, he keeps growing. Tiger has had veterinary care that he needed thanks to donations by local people and anipals. He and his brofur Jack, a rescue puppy that Tiger’s mom took in because Tiger and his human brother both liked him, are ready to go in for neutering. The local animal welfare humans are organizing a campaign to help pay for the operations. If you’d like to help, Amber Stubbs-Aydell, who has been keeping tabs on Tiger, said to go to the website for Black Rose Equine Rehab. I know Tiger isn’t a horse, but this organization has PayPal set up to receive donations. Make sure to specify that you are contributing for Tiger’s care. If more money is collected than is needed, it would be used for spay/neuter for another kitty or puppy. For more information on the history of this case, please see the first article on Tiger in the AT.